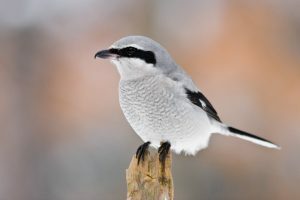 Northern Shrike is a species of medium- to large-sized predatory songbirds that spend the summer in the northern territories of Asia and Europe, as well as North America including Canada and Alaska, but they winter south in the temperate regions. 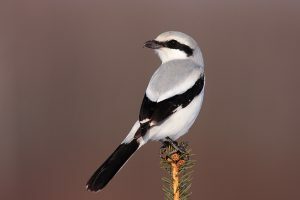 These passerine birds are characterized by a large head, a sturdy beak that is curved at the end, and medium-long black tail with white corners. These diurnal birds frequently travel through their range, living in groups containing more than six pairs and becoming solitary during the mating season. Their usual flying pattern is heavy and undulating, but they fly straight in a determined manner when attacking. To hunt prey, the Northern Shrikes sit on exposed perches and once the prey is located, they pounce on it in rapid, powerful flight. 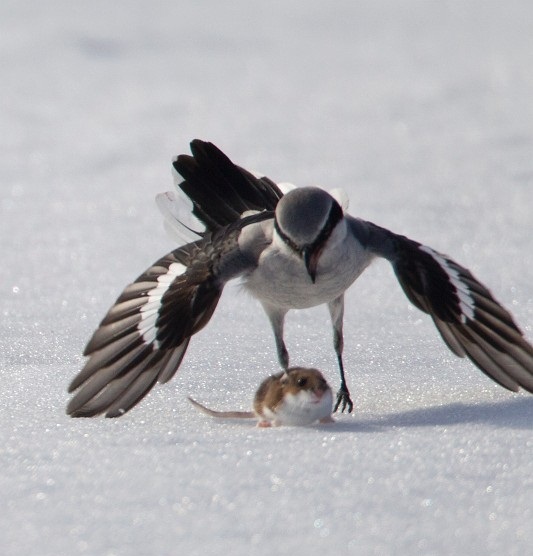 Even though a small prey is seized with their feet, the vertebrates are killed with their hooked bill. Living prey is often impaled on spines, thorns, or barbed wire and then consumed later. Northern Shrikes produce their offspring during the summer, usually once a year. During the breeding season, they develop strong monogamous pair bond that loosens over the winter. 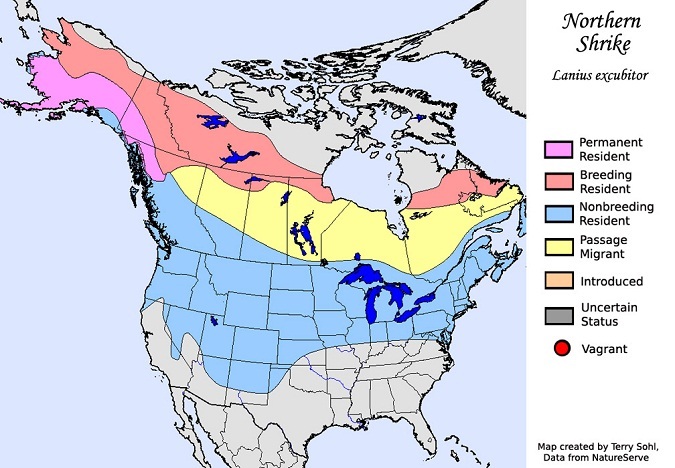 The male birds fly beyond their breeding range in search of potential mates. 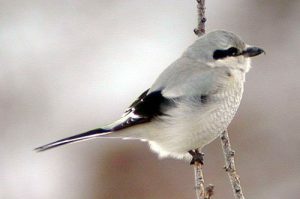 Once the female is encountered, the male performs courtship displays by fluttering the wings while singing or calling. 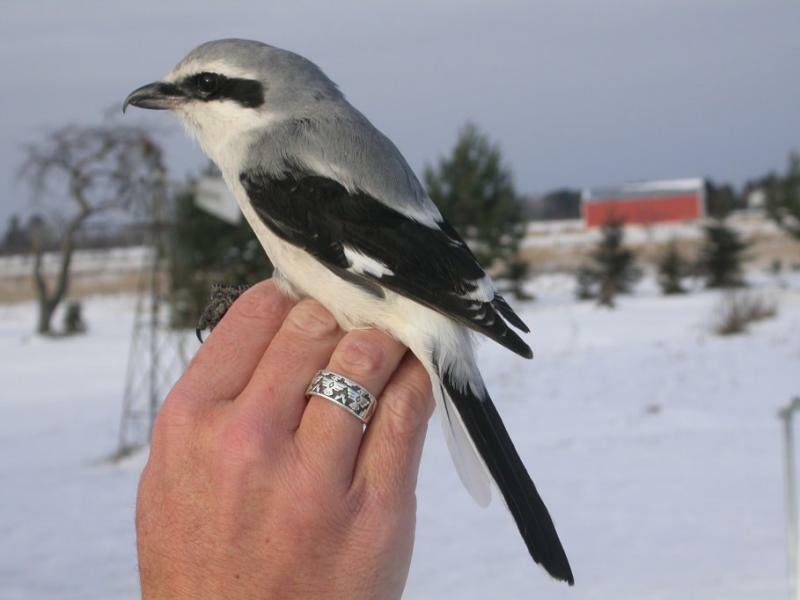 Moreover, the male maintains caches to entice females, which then give begging calls. Actual copulation starts after the male passes the stored cache to the female. 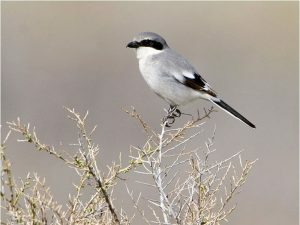 Both the sexes take part in building the nests, though the nest materials such as grasses, feathers, hair, twigs, and roots are collected by the male. After the eggs are laid in May, the female starts incubating while the male brings the food for her. At hatching, the offspring are pink-skinned, blind, and helpless, and they depend on their mother for food. 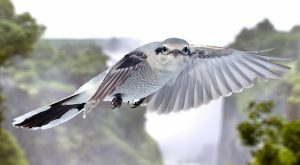 Fledging at 2-3 weeks, the offspring become independent after 3-6 weeks. The juvenile birds reach sexual maturity at about 1 year of age. These birds kill more prey than they can instantly eat, and store the excess prey for consumption during food scarcity. They have open cup-shaped nests, which are so deep that the tail of a female is only visible while incubating. 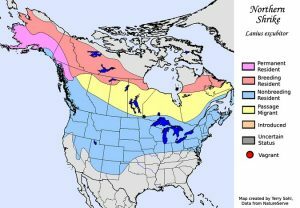 Published on May 18th 2016 by admin under Coniferous Forest Animals. Article was last reviewed on 25th May 2016.